A copy of one of the letters I sent to the Yankees in October 1991, when I was 16 years old. This was shortly after it occurred to me while watching a game from the bleachers that someone might be able to apply to be a batboy, and before I understood it was naive to expect a response. 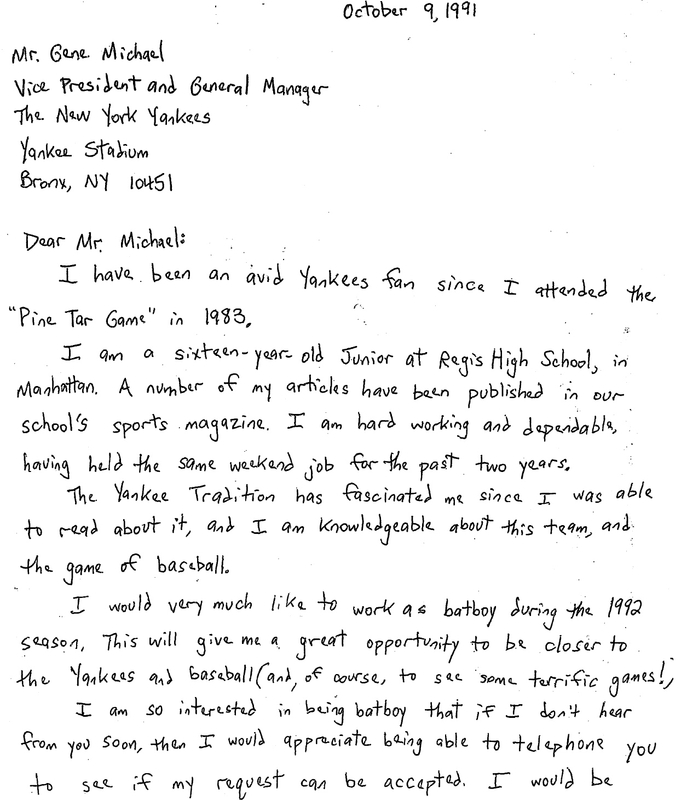 I mailed copies to everyone in the Yankees front office who I imagined might be involved in bat boy hiring, from George Steinbrenner on down to the field manager Stump Merrill. Looking back, my favorite part is the dual signature line at the bottom — my best attempt at age 16 to project to the General Manager of the New York Yankees that I meant business! I can imagine this as my five year old in a few years – he is so incredibly keen on the game, the players, the runs and strikes – and already believes with a conviction that only the young can manage that baseball, maybe even ‘being a batboy’ figures in his future. What an inspiring story this is of “I Think I Can” a la baseball! I love it.